It is over 30 years since Frances Le Sueur presented evidence that the hedgehog was first established in Jersey in the mid nineteenth century and by the mid 1970s had become widespread across the whole island (Le Sueur, 1976). Meanwhile, this popular and charismatic animal appears to have suffered a significant decline in mainland Britain, probably at least partly due to the increased numbers of badgers (Morris, 2006). It therefore seemed timely to conduct a survey of this species in Jersey, particularly as badgers are absent here. The questionnaires were distributed widely and the public were invited via radio and newspapers to ask for more copies. Four thousand were printed for distribution and more than 1,400 observations were submitted by members of the public covering the period May to November 2007, although some observations were submitted that related to dates outside this time (and have been included here). The questionnaires were accompanied by a map of Jersey dived into grids squares so that records could be easily marked directly on it. This was an attempt to avoid confusion resulting from people submitting incorrect grid references or identifying the same localities under different names through using a variety of different maps. The forms were completed anonymously to avoid some of the problems with asking for names, and the subsequent analysis has had to take account of possible replicated information (eg the same animals repeatedly visiting the same garden, or the same road casualties being seen by more than one person), see below. Twelve records were omitted as being too incomplete. Information was submitted for every month of the year, although the majority of observations were made during the summer months. A few animals were seen in daylight, usually a sign that they are sick. After eliminating probable duplicate records (ie multiple sightings of the same animal, identified as being reported from the same grid square in the same month), there were 626 records based on road casualties, 346 observations of hedgehogs visiting gardens and 93 seen (mostly alive) elsewhere. These 1065 records form the basis for the distribution map in Figure 1. 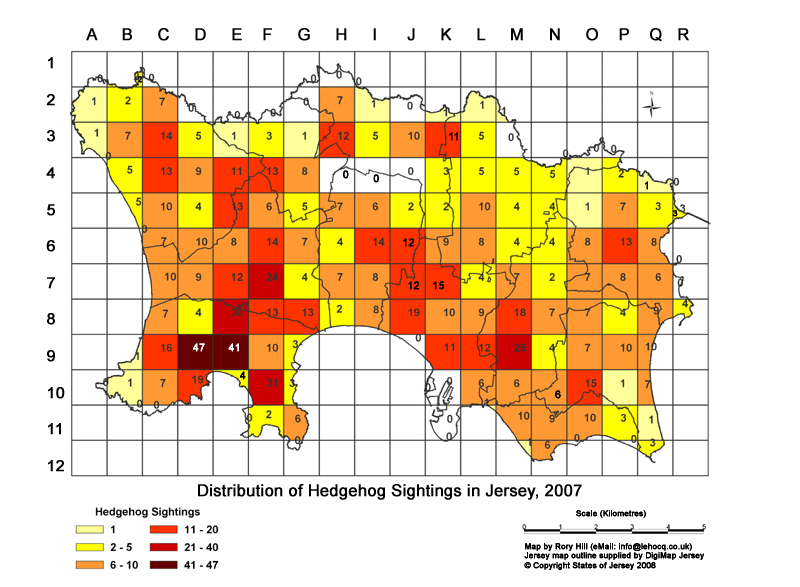 They are likely to include a few duplicate records, but not sufficient to affect significantly the apparent distribution of the hedgehog in Jersey. Observations elsewhere (Bright, pers comm.) confirm that numbers killed on roads do correspond to numbers alive, so road casualties represent a rough index of abundance. Fig. 1 shows the comparative abundance of records for different parts of Jersey. It appears that hedgehogs are widespread and occur in all the available habitats, from urban gardens and farmland to the moist areas of Waterworks Valley and even the dry land of St Ouens. However, to a considerable extent Fig. 1. also indicates the areas most frequented by observers. There appear to be a number of ‘hedgehog blackspots’ in Jersey, including the Rte de Trodez (St Ouen), Five Mile Road (with at least 11 animals being killed there) and the Rte Orange, with probably a dozen or more casualties. A few of these animals may have persisted as dried remains long enough to be recorded in more than one month and thus counted twice, but it is still clear that these are areas where significant animals were killed. There were also multiple reports from the Airport Road, many of which obviously referred to the same individuals and simply reflect the large numbers of people who noticed them. Several people reported the one dead on the Gorey coast road, outside the Barbecue site, probably a good place for hedgehogs to feed! The questionnaires invited people to comment on whether or not they still saw hedgehogs or no longer did so. Often the same comments would be attached to a series of roadkill reports, so to avoid this type of bias, only the sightings in gardens are referred to here. Householders would also likely be aware of changing hedgehog numbers in their garden, especially if they had lived there for a long time. Of the 346 reports originating in gardens, 141 included comments about changing status. Of these, six reports said that the animals no longer visited, three said that hedgehogs had never been seen in the garden and 132 confirmed that the animals used to come and still do. This is encouraging, especially as at least 20 observers had lived locally for more than 30 years (and one for 76 years!). However, only one or two respondents suggested there had been no change in hedgehog abundance and nobody commented on a perceived increase. On the contrary, there were several pessimistic comments to the effect that hedgehogs are not as common now as they were previously, and this was also implicit (although not stated explicitly) in may of the answers submitted. Increased traffic, agricultural intensification and changes to gardens and their immediate environment were cited by several people as possible causes of decline. However, at least one third of respondents blamed new housing, particularly infill development, for compromising hedgehog habitats and numbers. A couple of observers were more explicit, saying that the building of walls had impeded hedgehog movements. This is a common problem in many suburban areas of Britain where new houses are built behind walls or impenetrable fences. Obstructing free movement of animals by fragmenting their habitats in this way restricts gene flow within a metapopulation (ie leading to inbreeding) and is a potential long-term hazard for many species. One person suggested climate change might be a threat, and this could certainly be true. A drought lasting several weeks would leave hedgehogs very short of worms and other invertebrates in the sandy soils of Jersey, particularly if irrigation had to cease in order to divert water to more immediate human use. One hedgehog was reported with a polystyrene cup jammed on its head. Whilst superficially amusing, this does represent a recent but increasing danger to hedgehogs. They attempt to lick out the dregs from within, then their spines become jammed into the stiff foam as the animal tries to withdraw its head. This has often been reported elsewhere and underlines the need for such litter not to be discarded carelessly. Another hedgehog was drowned in a garden (swimming?) pool. Pools and smooth-lined garden ponds are a relatively infrequent but nevertheless persistent threat to hedgehogs here and elsewhere. A small piece of chicken wire hung over the edge could allow hedgehogs to climb out, and save many lives. Clearly the hedgehog is still widespread and probably fairly abundant over most of Jersey. This is very encouraging and hopefully will continue. Some of the threats, such as food shortage due to drought or loss of feeding areas, could be alleviated by householders putting out food in their gardens (as many already do). However, the steady loss of land to housing and other forms of hard development must result in an overall decline in hedgehog numbers and fragmentation of their remaining populations. Increased traffic will also be a threat, and it is clear that many hedgehogs already die on the roads each year- more than 600 in the year of the present survey. This must represent a not insignificant proportion of the total population of the island. We are extremely grateful to the many people who took time to complete the hedgehog survey forms and send them in. It is gratifying that so many local residents are willing to take their wildlife and environment seriously. We thank the National Trust for Jersey, Action for Wildlife and the Jersey Organic Association for circulating the questionnaire form among their members, and also thank Piers Sangan, Paul and Maya Hammarsal in connection with handling the data received. A Natural History of Jersey. Phillimore, London. The New Hedgehog Book. Whittet Books, Stowmarket. A rough outline of Jersey divided into grid squares, each about 0.5 km wide. Questionnaire respondents were invited to identify the square(s) to which their observations related, with their map printed in colour with roads and other landmarks added. This map shows the number of records of hedgehogs received for each grid square, once likely replicated observations had been eliminated. The numbers crudely indicate relative abundance of hedgehogs, but also reflect the areas most intensively observed. There is a curious lack of records from three adjacent squares in row 4.